You’ll be in the mood to twist and shout today if you’re a pretzel lover. 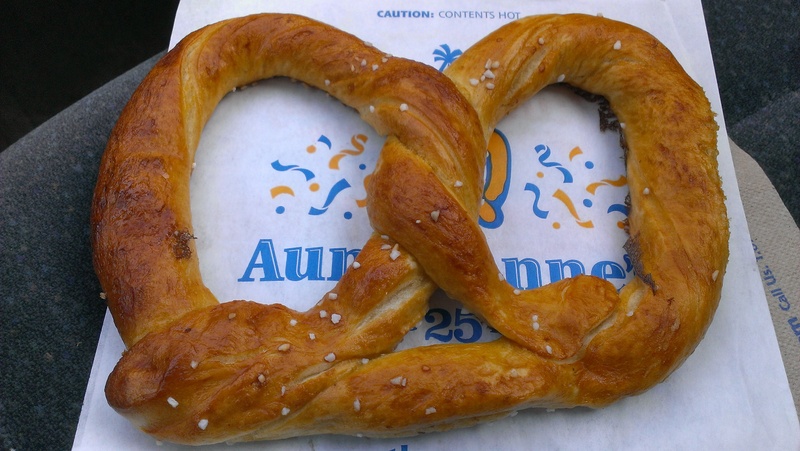 April 26 is National Pretzel Day! It is believed that the pretzel was created by a bored monk (is there any other kind?) in the year 610, at a monastery somewhere in southern France or northern Italy. Scraps of dough were formed into strips and folded, to represent a child’s arms in prayer, with the three holes representing the Holy Trinity. The warm dough was offered as a bribe to children who memorized Bible verses and prayers. They called the doughy creation pretiola, Latin for “little reward.” As it spread through Italy the name was changed to brachiola, meaning “little arms.” Germany, probably more closely associated with pretzels than any other country, offers up an alternate version of their backstory, claiming they were invented by desperate bakers being held hostage by local Dignatories. Whatever their true source, pretzels (called bretzels there) have been an integral part of German culture for centuries. German immigrants known as Pennsylvania Dutch introduced the pretzel to America in the 19th century, and soon handmade pretzel bakeries flourished throughout the Pennsylvania countryside and beyond. In 1850, the first hard pretzel bakery opened in Lilitz, Pennsylvania; hard pretzels became a popular snack food that appears in various shapes and sizes – sticks, rods, braids, and loops. In the 20th century, street vendors in cities such as Chicago, New York, and Philadelphia popularized soft pretzels. The pretzel remains an iconic image of Philadelphia today, with residents consuming 12 times the national average each year. I love pretzels, particularly freshly baked soft pretzels warm from the oven, sprinkled with salt and dipped in yellow mustard. I will rarely emerge from a shopping mall without eating a pretzel. Sometimes, I go to the mall just for a pretzel. Today was one of those days. Auntie Anne’s never disappoints.